A New Year’s Eve tradition in Japan is to watch NHK’s “Kouhaku”, which is a five-hour songfest of live music that continues on until just before midnight. This is a light-hearted battle between women singers and bands (“kou” or “red”) and male singers and bands (“haku” or “white”). 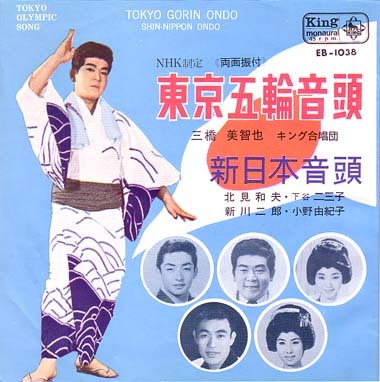 This year, singer Kouhei Fukuda performed the 1963 hit, “Tokyo Gourin Ondo”(東京五輪音頭), which roughly translates to The Tokyo Olympic Dance Song. In 1963 and 1964, the year of the Tokyo Olympics, Tokyo Gourin Ondo would go on to sell 1.3 million records, and in some ways, made the singer of that song, Haruo Minami, the face of the Tokyo Olympics. Minami was already a well known singer in Japan, performing the popular music of the time which would later be referred to as enka. Minami stood out because he performed in kimono, which was not common for men in the 1950s. But what makes Minami very interesting is his war past, or more accurately, his post-war past. At the age of 20 in 1944, Minami (probably under his actual name Bunji Kitazume), was drafted into the Japanese Imperial Army in Manchuria. Just after the Pacific War ended in August, 1945, Minami and hundreds of thousands of other Japanese were captured by the Soviet Union army. Minami eventually served four years of hard labor in Khaborosk, which is in Siberia. Although about 60,000 of approximately 600,000 Japanese POW died in the Siberian labor camps, Minami stayed alive until 1949 when he was allowed to return to Japan. According to a music critic, it is said that Minami sang this song with such passion because of how hard Japan has worked to re-build after the war, and nobody understood that more than a man who returned from the labor camps of Siberia. Here is Haruo Minami performing “Tokyo Gourin Ondo” at Kouhaku, on either December 31, 1963 or 1964. Posted in Geo-politics, Japan, Pop Culture and tagged 1964 Tokyo Olympics, Bunji Kitazume, Haruo Minami, Japanese IMperial Army, Khaborosk, Kouhaku, Kouhei Fukuda, Manchuria, Siberia, Soviet Union, Tokyo Gourin Ondo. Bookmark the permalink.